Boiling a chicken is easy. I mean you just boil it and your done. Ok, so it's not quite that simple but near enough. After my visit to St John last week I felt inspired to have a quick look through Fergus Henderson's cook book and saw a recipe for Boiled Chicken and Leeks with Aioli. I shuddered for a moment remembering Boiled Chicken at home when I was a kid. Made when you were ill, the stock itself was the important thing, the broth tasty and warming . Italian (insert your own ethnic background here) penicillin, the cure all for every ailment known to parents, apart from headaches which required a pot of water and oil precariously balanced on your head whilst someone stirred (don't ask). Anyway, the meat from said medicinal was horrible, all the goodness boiled out and the meat anemic and stringy. Henderson's recipe leaves no room for dry meat. The chicken is cooked at a very very slow simmer so that the meat is silky, moist and tender and the aioli (kind of garlic mayonnaise, kind of, only kind of) , holy crap, the man makes it with 20 cloves of garlic and boy does it pack a punch. The guys will love me at work in the morning, as will the dental hygenist at tomorrow's appointment! The cool thing is you end up with some great light chicken stock at the end of it. Yes, well done on the cricket. That looks yummy. Simple meals are often the best. 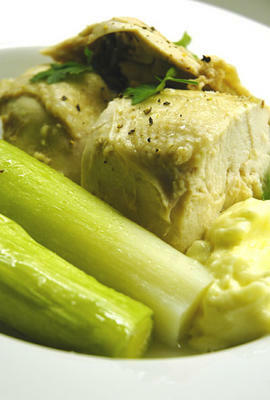 I simply adore aioli, and the idea of pairing it with silky chicken sounds heavenly for comfort. Leftovers surely would make a lovely sandwich smeared with aforementioned garlicy sauce. Did you serve the stock seperately, or save it for another use? A splash went on the chicken before serving and the rest is in my freezer.